The biggest movie event of the year has arrived! Golden Ticket Events will be holding a special advance screening of Star Wars: The Force Awakens on December 16, 2015 10pm at SM Megamall Cinema 3. Join Princess Leia, Han Solo, Luke Skywalker, Chewbacca, R2-D2, C3-PO, plust an all-new cast of heroes, bots, and villains in the newest Star Wars chapter to hit the silver screen! Catch this once in a lifetime treat with your friends, family, and loved ones! Every purchase comes with free popcorn, bottled water, and loot bag including 1,000 PHP worth of goodies and Gift Certificates! Hurry, catch this once in a lifetime treat! 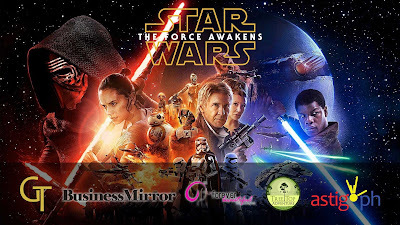 Grab tickets online at http://j.mp/starwarsph or contact Ken at 0917-518-5377 or Den at 0917-555-3366. Brought to you in part by Forever Beautiful, Treetop Adventure, Business Mirror, View Magazine, Cook Magazine, Zoomanity Group, ASTIG.PH, and Tag Media and Public Relations.